Place the tenderloin on a large plate and rub the herb mix all over the tenderloin. Place the tenderloin in a ziploc bag and back into the refrigerator. Let it marinade for 2 hours or more. Turn the oven to 400. Take the meat out of the fridge, and place it either on a flexipat. With a pastry brush, brush some olive oil on the tenderloin, sprinkle more of the herb mixture as well on each tenderloin. 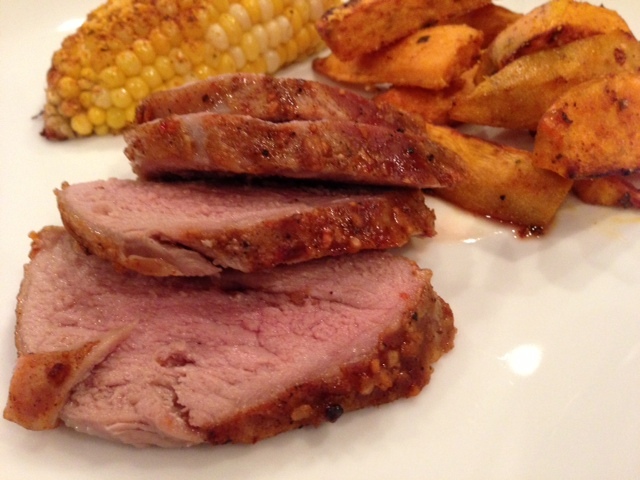 Cook the meat for 20-25 minutes depending on the width of the pork tenderloin or until a meat thermometer register 150F. When the meat is cooked, remove the pork tenderloin from the oven, and let it rest for 5 minutes. Remove the tenderloin from the flexipat, add 1 cup of broth to the pan, and mix and scrape the juices. Drizzle this “sauce” on the tenderloin. Et voila!!! 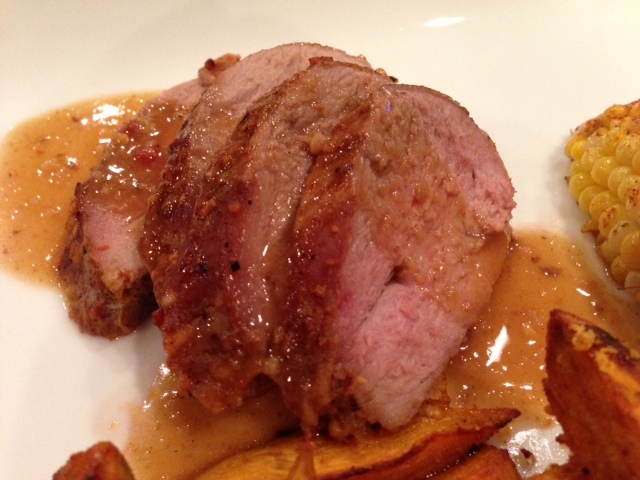 I served the tenderloin with roasted Sweet potatoes fries, and roasted corn. So good!!! Does the maple flavor come from the smokehouse herb mix?